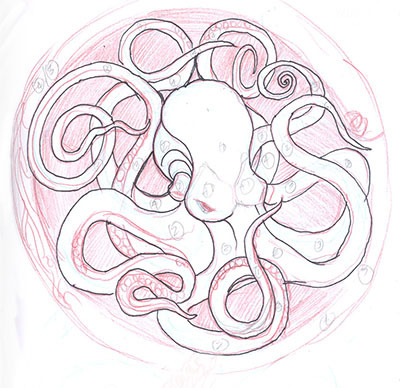 The initial sketch of an octopus design is finally finished. And it still needs quite a bit of work. While I like the overall composition, the tenticales still need refinement. I imagine the piece on a piece of rippled orange stained glass, or perhaps on a bed of aqua blue flattened marbles. This is a design done for the simple love of the elegant, flowing lines of the piece. I don’t have a particular client, genre or motif in mind.